Note: This post will be posted on both techinmusiced and ukestuff. One of the best aspects of this “non-job” has been the people I have had the opportunity to meet. I can’t think of a single person in the area of music education technology that I have not immediately liked. Simply put, the music education technologists that I know are also some of the finest, most intelligent, collegial people I have met. I learn from them, as I am sure they learn from me–and I enjoy hearing about their lives and getting to know more about them. This winter, I had the chance to present sessions at the Maryland Music Education Association, mostly thanks to Robby Burns, who has served as the MMEA’s technology chair. Robby is an incredible teacher and technology user, and has a blog, podcast, and even a book on digital organization (Buy it! Paper. Kindle. See his awesome promo video at the bottom of this post). If we have “specialties,” I would say that Robby is a specialist in secondary band and technology automation. He looks for ways for technology to simplify his life and to make automatic processes that solve problems, keep things organized (for himself, his program, and his students), and to ultimately create more free time for himself and his family. When you see Robby’s presentations, hear his podcasts, or read his book or blog, you need to know that like all the music technology experts I have met, he lives what he is teaching. The knowledge comes from real life experience, and is personally tested. One of the highlights of my trip to Maryland was spending 30 minutes with Robby (until we were kicked out of the exhibit hall as it closed) simply talking about apps that either of us did not know. One of those apps was Any Font. Robby discussed how he loved Any Font, as he was able to use any font on his iOS devices for anything–documents, presentations, whatever. While I should have been writing down every app he suggested (I only typed out a few–and thus, I am not the expert on digital organization), that conversation is locked in my brain. I blogged about the new version of Chordette the other day, an app that provides a way to use a font to make ukulele chords–something of great use if you teach ukulele. However, if you use the fonts embedded with Chordette–they are not going to show up correctly on an iPad (ever get the Keynote message that a font is not available? Even if the font is no longer used in the presentation? Any Font is one solution, and there is another that I will add at the end of this post). I have also been working with the developer of Chordette to make a font set that uses the colors of the Aquila KIDS strings–and would love to use those fonts in my presentations. Fonts are always better for a smaller document size than an image–which is why a PDF of music created by a software program (e.g. Finale, Sibelius, Notion, Dorico, MuseScore) is always smaller than scanned music (embedding a picture in the PDF). I haven’t had need of fonts other than the standard fonts embedded in iOS, but Any Font allows me to put the Chordette CGCA ukulele fonts into iOS. You send a True Type Font (TTF–most are in this format) to Any Font (you can even “Open In” from iCloud Drive or Dropbox, but easiest is Air Drop from a newer Mac to an iOS device), and then select the fonts you want to install on your device. 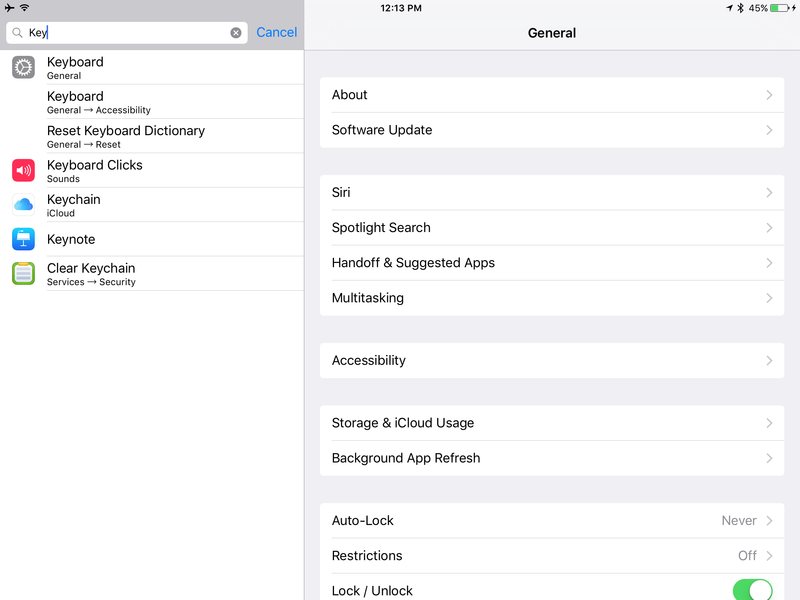 Any Font sends those fonts as a profile to your device, enabling those fonts for the iOS device to use. If you delete the profile, the fonts go away. You can always add a font and take it away later. Any Font also offers 1,000 additional fonts for $2 as an In-App Purchase–a pretty good deal. Of course, you can find a great number of fonts on the web for free, including musicological fonts that might be helpful in documents and presentations. So…if you have ever wanted to use other fonts on your iOS device, or have had issues with Keynote telling you a font wasn’t available, Any Font is a great way to solve both of those issues. It does make you wonder why Apple hasn’t made it possible to simply add fonts to iOS as you can on a Mac–perhaps this will be resolved in the future. Until then, I recommend Any Font to you, and want to offer thanks to Robby Burns for bringing this app to my attention. Final note: Are you getting the “font not available” warning in Keynote, even after making sure all fonts were in the system? If you don’t want to install the not-used but still considered “missing” font, do this: Export the Keynote as PowerPoint, import that exported file into Keynote. Save the file. Problem solved. 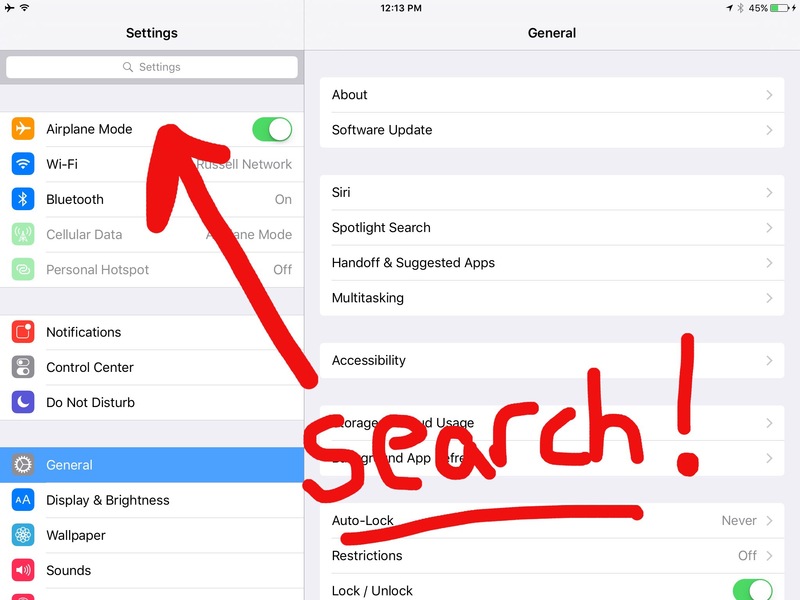 iOS Tip: Search in settings! This past week, I taught a series of Á la carte classes on technology for the Wisconsin Center for Music Education. As usual, I shared my knowledge but also left with new knowledge. 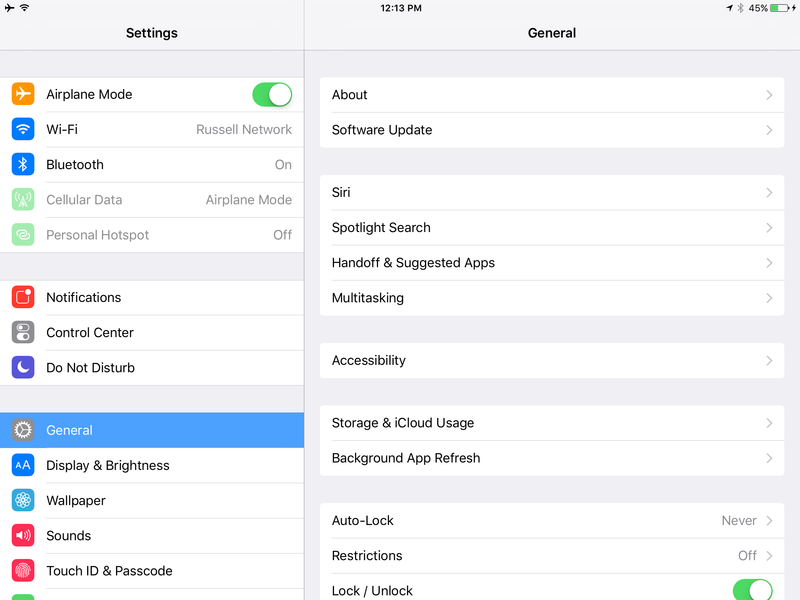 While going over the basics of iOS, Chris Telfer showed us that you use search in Settings to find a specific setting. I have spent a lot of time searching for specific settings in the past, and I never paid attention to the search box that is built into Settings. Pull down in the left colum and reveal the search box. For example…let’s say you want to check usage, but don’t remember where it is. Go to settings, pull down on the left menu, and enter “usage” in the search box. As soon as you hit the “Search” button (where return normally is), you will find what you are looking for. This is a great tip–and I appreciate that Chris was willing to share it with us! Scott Kantner is the developer of NextPage, a PDF Sheet Music Reader for the iPad. I describe NextPage as forScore-lite, or unrealBook-lite. As a middle school choir teacher in a 1:1 setting, I found that the best-of-class PDF music readers offered too many features for my students. Instead of singing, they would be using the metronome, searching the web, or playing the piano. While I can lock them into an app with our MDM, the apps did too much. Even the free option, PiaScore, did too much (they did not understand why I asked for YouTube to be removed from the core of their app). NextPage was a good solution, and we bought 300 copies of it. The program offers all the basic things you need in a PDF music reader. We eventually moved away from NextPage as Showbie could be used as a PDF viewer with annotation. NextPage would be a better solution, but it is easier for me to put students into one app for the whole hour rather than to try to change apps throughout the hour. Every time you re-focus an app, strange things happen to some student iPads. So…I like NextPage and recommend it, even though we are not currently using it. Some users might find NextPage a good, uncomplicated option for music reading on the iPad. Scott is starting a blog about NextPage 3, and sent out a newsletter. The newsletter is short and talks about the status of NextPage–and it also has some performance tips at the bottom of the newsletter. I wanted to share it with you. Your connection was at the mercy of your wi-fi network. If your network was not set up properly with Apple's Bonjour Services enabled, your Apple TV didn't work. Additionally, if your network was slow or bogged down, your AirPlay connection would suffer (stutter, crash). You are always at the mercy of Apple's most recent movie releases that can be purchased in the iTunes store and played on a TV. Imagine my daily joy of teaching a freshman men's choir while Cameron Diaz's “Bad Teacher” was a daily selected movie. The Apple TV requires an HDMI to VGA adaper, most notably the Kanex ATV Pro. It became cheaper to install one of the “AirPlay” apps on a computer already connected to a projector than to purchase an Apple TV and Kanex ATV Pro. The Apple TV always mirrors an iPad in a 4:3 format (unless playing a movie), often adding an additional border that is not present if you connect your iPad to a projector directly with a cable. With iOS 8, Apple quietly announced a new feature with the Apple TV…you can connect to an Apple TV without using a network. This is called peer-to-peer networking. Apple recommends connecting your Apple TV to your network with an Ethernet cable, and then simply searching for your Apple TV as a separate device. Here's the trick: you need an iPad from 2012 (or later) and the latest version of the Apple TV (Ver. 3, Model A 1469), or newer (should the next version come out). Many problems with Apple TVs and mirroring are directly connected to wi-fi networks. As a result, I literally couldn't wait to try mirroring without having to use a network. Today I purchased one of these new Apple TVs ($99 plus tax) and immediately went home and installed the device in our TV system, with the intent of bringing it to school (we had an existing 1st Generation Apple TV, so I simply unplugged it and plugged in the new Apple TV). I didn't have an ethernet connection available, so I used our guest wireless network to connect the new Apple TV. Updating the device to its latest software took about 30 minutes. Once that was finished, I looked for the Apple TV, and sure enough, it was present on the AirPlay menu. For the record, my iPad runs on our personal wireless network, so it is not using the same network connection as the Apple TV. Everything works flawlessly. There is still a slight delay in audio/video, which should be expected. I love the idea that the Apple TV doesn't have to be hindered by a wi-fi network any longer. This really frees the teacher that loves their iPad, wants to project it at school, but has an anti-Apple IT department that will not authorize the Apple TV (or iPad) to connect to the district wireless. Furthermore, if your iPad is already connected to a network, your wi-fi connection on your iPad remains connected to the internet–I have tried to use Ad Hoc networks generated by my MacBook to mirror to Reflector in the past, losing my connection to the Internet. I see presenters across the country bringing along an Apple TV to be able to wirelessly project to their audiences (I will be doing this as well). Was there anything special in the setup of the Apple TV? No. I choose to rename my AppleTV and to enable a password to connect to the device; but even this is unnecessary. The only thing you have to do is update the operating system of the Apple TV, and have a 2012 or later MacBook (yes, AirPlay works with later MacBooks), iPad, iPhone, or iPod Touch running iOS 8. There are still additional benefits for using a computer-based AirPlay program, such as the ability to project more than one device at a time (the Apple TV is a one-device-at-a-time device). But the ability to wirelessly project without needing a network is a wonderful addition–at a very affordable cost. Have you been waiting to wirelessly mirror? Here's your chance! Note: My 1st generation Apple TV, which we use to watch movies from iTunes, Netflix, and from my Mac Mini (we use Mac Mini as a Entertainment Center with all of our audio and movies), will NOT allow peer-to-peer networking with a MacBook, iPad, iPhone, or iPod Touch. Although the exterior of the device hasn't changed (a rather understated black box), the internals of the Apple TV have changed over time. Make sure to buy the 3rd Generation Apple TV, Model A 1469, or newer.